Totango has unveiled a new feature to help executives measure the impact of their customer success teams. Totango is a customer success service software provider that helps subscription-based businesses regain and grow their customer base. The new feature is part of the company’s executive console that now consists of two parts – the Customer Health Console and the new Team Performance Console. 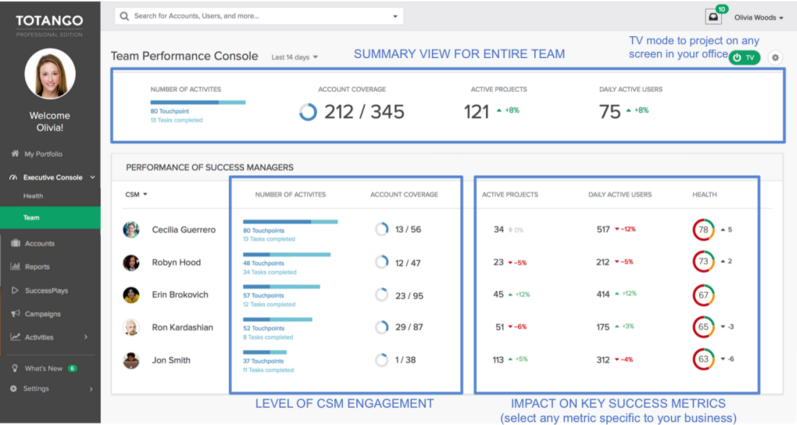 With the Team Performance Console, executives have a centralized place to check account coverage, the level of engagement and impact of each customer success team member on their respective account base. In addition, the Team Performance Console can be leveraged by executives to guide their teams and prioritize their attention to specific team members. The console’s leaderboard can also help executives gamify their team’s performance and identify the impact each team member is having on the metrics that matter for customer success. The Team Performance Console announcement comes after the company’s launch of Customer Success Campaigns last month. These campaigns help users automatically engage with every person in their customer base with the right message at the right time based on the customer’s behavior ad actions.